After several hours Alexander finally snapped out of his deep slumber. Looking around he felt a sense of amnesia as he could hardly remember what had happened previously say for a few parts. Mostly however he remembered the girls he was meant to find. He decided he may as well get started right away. Standing up and stumbling slightly as lightheadedness very quickly washed over him, Alex made his way out of the Alley and into the street. After looking around he quickly came to realize where he was. Aramore's historical district. It was here where one would find various statues of Azeron and Serileth. However, no matter how hard he looked he could see none, after a few moments though he caught sight of a pile of rubble. Alex slowly stepped up to the once glorious statue and quickly came to realize that on what was left of the pedestal was a small fragment of his father's mark. "And they called me a blasphemer and heretic.. when things like this are happening. I wouldn't doubt that they even orchestrated this heinous crime.." he muttered as a tinge of hatred slowly rose up within his chest. Alex turned away from the rubble and looked up and down the street he was on, waves of people were walking past, and judging by their attire it must have been for a ceremony. At this point Alex looked to the sky and noted the sun being directly above him. "Sermons have just recently reached their end. Hmm.. no doubt discrediting me further.. nothing fuels them more than targeting any source of 'heresy'" he muttered, his tone thick with aggression as he began to walk along the street. "I haven't even got any idea as to where to find them.. I remember.. two of them looked.. exotic for the lack of a better word. Unlike any person I've seen. The other.. the robes, perhaps she was a mage? I should hope she's Teresian.. I don't much like the idea of traveling all the way to Yarrose to find one person." Alex sighed to himself as he came to a bridge. He stepped over to the edge and looked down at the district below. "I just hope I know what I'm doing.." he muttered under his breath as he turned and leaned against the railing, now letting his head drop back so that he was looking to the sky once more. Clear blue, with several flocks of various birds native to Aramore flying in seemingly random directions. "Even the bird, upon birth and being able to fly knows what it must do. Am I really that ignorant, that such a simple creature stands superior to me?" Alex wondered aloud as he soon found himself lost in thought, still staring up into the sky. The Aramore Historical District... Keiko didn't come here very often. She tended to prefer the training yard, for a variety of reasons. But for this day in particular, she felt compelled to come here. As if guided by an invisible hand, or maybe she just wanted a change of pace. Really, it wouldn't be all that surprising if that was the case. Keiko practically spent all of her time training herself and getting disappointed by fights with no challenge to them. That was a particular problem ever since she improved her techniques. So this might as well have just been a trip to clear her head. Maybe find a clue as to what it is she should be doing. Keiko would arch a brow at a sight that she had become a little familiar with. A man named Alexander, she had never personally met him before, but he was certainly a famous man, or infamous, depending on where you were raised and what your beliefs were. The Bronze Dragon Shifter didn't hold any extreme opinion of him either way. Short of knowing his name and appearance in advance, he was honestly just another person in the city. A stranger that she hadn't met. That being said... He seemed a little out of it, as if drunk, or recently awoken after an awful night of sleep. The Dragon couldn't help but be a little curious about it, and she'd follow him to a bridge which overlooked the district below. He seemed to be lost in thought, sometimes musing aloud to himself... She wasn't quite able to hear everything, due to this being a city and there was often noises which could drown out even one's own mind, but she was able to get a rough gist of what was going through his head. He was looking for three people. Apparently one was from Yarrose... And after that, he was trying to find out what his purpose was. Thinking over that even the birds seemed to hold a better grasp over their destiny than he over his. Keiko would merely approach at a calm pace. "They merely follow instinct... Shifts in weather tell them where to go, basic needs drive them. In some ways, they're not entirely unlike us, but I can hardly fault you for not being able to do things as naturally as they can. ", the Bronze Dragon Shifter would chime in. She'd stop next to him, looking out to the district below. "It's Keiko Ito. ", she would then state, glancing over at him a bit as if to gauge his reaction. "My name, I mean. ", she elaborated. The Dragon must have looked quite odd in the middle of what was otherwise a very Human city. Scales covering the arms and legs, chainmail hauberk, a greatsword that rivaled her own size... Yet, here she was, walking through the streets naturally as everyone else, just like this was her home. That was exactly what Aramore was. Alex continued to stare upwards as he heard the voice of Keiko, mentally preparing himself for whatever may come next. "If you've come to spit obscenities at me I'm afraid you'll have to get in line. Seems most of the city has you beat." Alex said almost sullenly as he let his head drop. He then glanced over at Keiko and felt his heart jump slightly. Instantly his fathers words and the visions of the three girls returned to his mind. Alex quickly looked Keiko over as to clarify her appearance with the one he had saw and couldn't help but be filled with a sudden sense of joy, finally something seemed to go right. "I'd imagine you already know who I am, Alexander Ainsland. Heretic and Blasphemer of Aramore.." he said, a tinge of bitterness rising up in his voice. "Do be honest, I'm surprised you haven't already pelted me with stones or attempted to run my through.. or simply cleave me in half after what the chapel has said about me." Alex shook his head at the thought. No doubt that is what today's sermon was about. "Don't mind my asking but, are you some sort of mercenary? You certainly look the type." Part of Alex actually hoped so, paying her would be much easier than somehow convincing her to join him in an aimless quest no doubt. Regardless he felt he'd have no other chance but this one, so whatever he intended to do, he knew he'd need to act fast. Keiko would grin lightly at his words, though not out of any malice for the man. "Are you kidding? This City hasn't exactly been the kindest to me either. They think me a walking omen. ", she'd respond in a slight jest. Still... Aramore was her home, and it showed in how she looked at the city. "It's not all bad, you know. People are just afraid of what they don't understand. They don't know you very well, short of your relation. ", she'd comment further. Keiko never met Alexander until this moment, but she knew him because of the rumors. How he was related to Azeron, or supposedly he was, in any case. The Bronze Dragon Shifter didn't really know what to make of it, and she didn't care much either way if he was the son of Azeron or not. He had a purpose here, and he just needed to find it. Not entirely unlike herself in that regard. "Well, Alexander. 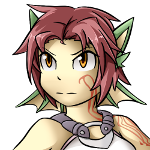 I am Keiko Ito, the Dragon unlike any other, the Walking Omen of Thera. ", she'd respond, grinning a little again as she looked to him. There really wasn't much of a need to be so depressed about it all. Left one little time to enjoy life, after all. "If I'm to be honest, if I tried listening in one any of those church sermons, they would probably think I have some sort of malicious plot in mind... Besides, I don't believe words alone. Easier to judge a man by how they carry themselves. If you were the laughing mad maniacal man they claim you are, we probably wouldn't be talking right now. ", Keiko would reply. He seemed to be so down in the dumps, but he'd finally snap himself out of it and ask if she was a mercenary. "Not exactly. I don't really accept payment for my services, though I certainly wouldn't turn Essence away, either. No, I'm more interested in a decent fight... Aramore is a peaceful city, and for all my skill, I'm not able to join the Knights of Azeron. Father never explained why, but I assume it had something to do with my race, and the public opinion of me. ", she'd theorize a little on that subject, not that it really mattered, though. She couldn't change the fact that she wasn't in the Knights. Maybe she'd join it one day, but that was neither here nor there. "I intend to set out on a journey, find my purpose. Improve my skills, and become a Knight, even if it's not for Azeron... Not the perfect plan, I'll admit. ", Keiko would explain, finally she'd turn to face him properly, leaning slightly on the railing of the bridge. "And what about you? Any particular goal you lay claim to? When you're not spreading your ah... Blasphemous religion, or what have you. ", she'd tack on the last part with an obvious jest to her tone of voice. If that didn't give it away, the grin still on her face would have. "My only real goal as of now is to battle against corruption. I shall act as my father cannot due to his current mission and state." Alexander said with a nod as he raised a hand and closed it into a fist. "I won't stop until I either drop dead or kill corruption at its source!" he then added. At that point Alex shook his head and let his hand drop back to his side. "I must admit however, it will be a brutally difficult task, perhaps I could convince you to aid me in my cause? I have no doubt that you and I will both be able to receive benefits from such a task should we complete it." Once he had asked the question, he began to hope that fate was on his side. With luck Keiko would accept his request, thus marking off one of the people he needed to find. Alexander would begin his response by saying that his only goal was to put a stop to the corruption, doing what his father cannot, only stopping if every last bit of corruption was eradicated, or he ended up dying. "I can respect that. ", was all she could say in response, as his next words were an admittance that it would be no easy feat... And he wasn't wrong about that. As it was, there were people out there that put both of them to shame, even if they combined their powers. That wasn't even getting into the beasts twisted by the corruption. Or fueling it, as the case may very well be. "If this is what you intend to do, it will take more than just us to get anywhere. ", the Dragon replied. She was still mulling over the idea of joining him, chances are she'd find all the fights she ever wanted, and then some... And she'd definitely be doing a service to the world, from the sounds of things. What did she really have to lose? If things didn't work out, she could just leave. He didn't seem the type to steer them wrong, however. "Bit of an interesting proposal you have there. I do have to admit that if I join you, I'll have more than my fair share of battles... I'd certainly grow stronger, at that. ", Keiko would muse aloud. It really didn't seem like a bad idea, and maybe it would improve their reputations if they struck out at major sources of corruption. In any case, she did need to team up with others. There was simply no way she'd obtain the strength to conquer the threats to Thera alone. But a group of warriors? That was far more reasonable. "I'll join you. Though I feel that I should give you a fair warning. I've already had a battle with an Assassin. I don't know who hired him, or why he came for me... And he's certainly not dead; a little too skilled for me to be rid of him that easily. He was able to attack me right here in the middle of Aramore. Somehow, entire patrols and groups of people had up and vanished. Though I suspect that played in a part in him suddenly leaving. ", she would begin to explain to Alexander. No sense in keeping something like that secret. It may save their life to know that the Dragon was being hunted by someone. For whatever reason it was, she honestly couldn't guess. "So if that's a deal breaker, I'd just have to offer my apologies instead. Though no matter what we do from here on out... I recommend caution. I suspect there's far more than just corruption at work here. ", Keiko admitted. A lot of it was guesswork on her part, but her instincts had rarely been wrong about something, and it's not like there was any harm in saying any of this. "Hardly, if anything it reinforces my urge to travel with you. Such a criminal needs to answer for his crimes, and being an assassin.. I don't see much room for redemption say for through death. Alex said as he crossed his arms. "You certainly seem rather capable, no doubt combined with my own power and capabilities an assassin will become fairly easy prey." He then added with a nod. At that point Alexander turned to completely face Keiko, extending a hand as he did so. "So long as you are willing to travel with a man who's likely hunted by the majority of this city, I'm willing to travel with a girl who's hunted by a mere assassin. If anything it should prove to bring some fairly interesting events. Maybe even a good battle or two if luck holds." He then declared with a slight grin, mostly happy due to the potential chance to take an assassin out of the world. Keiko would listen as Alexander gave his response, it seemed the prospect of facing off with an Assassin didn't bother him very much, and normally she would be inclined to agree... But this was no ordinary foe that chose to hide in the dark. "Well, as I said. He's not a normal Assassin. He was able to attack me in broad daylight, and either he or his employer were able to orchestrate everyone being absent during that time frame. ", the Bronze Dragon Shifter explained. It really wasn't a good idea to underestimate their enemies at the moment... But it did excite her. "Well, if people in the city honestly want to pick a fight with you, then I'll handle it through duels. I won't have to take anyone's life, either... Truth be told, I think they'll leave well enough alone, though. They tend to keep their distance from me. ", Keiko then added... So, what else was on the agenda? It was probably a good idea to share the information she did know about the Assassin, that would be a good starting point, she thought. "Now, as for the Assassin... I didn't recognize his garb, so he's probably foreign to Aramore." She theorized. "He seems to have some sort of magic as well, able to teleport. He wielded crossbows, though they didn't fire normal bolts either. Seems to be a case of more magic, fighting him off was no easy task, as he proved skilled enough to stop my attack from hurting him... If not for the fact that I can breathe fire, I may not have walked away from that encounter. ", Keiko then finished her explanation. If she knew more about him, she could make a better gauge of his abilities... But he was an unknown. "So it seems we have two warriors now. I think we'll need a little bit more, however. Any ideas on where to start? ", Keiko inquired. The irony that her first companion, aside from her Father, turned out to be another outcast in the city of Aramore was not lost on her. Though they were outcasts for different reasons, it was still something that they could relate on. A Heretic and a Walking Omen... Yeah, she could only imagine how people were going to react. But it just meant she'd need to prove them wrong on all of their assumptions. Alex thought for a moment before finally snapping his fingers upon a decent conclusion. "I'd imagine that there's quite a large amount of men and women coming into Aramore from the docks, no doubt we could scope the area out and determine if we'd like to recruit anyone there!" He said, not only eager to find more allies, but being at the dock meant he also had a fairly quick means of getting out of Aramore should he need to. "The ships there come from all over Thera, we may even get lucky and get some powerful mage from Yarrose. I hear that they are rather specially trained over there, no doubt that kind of magic would be useful." He muttered, descending into thought once more. It was then that he suddenly recalled that the Queen had not too long ago went to meet with some representative or another from Yarrose. He couldn't recall details but maybe if they were back they could even run into one of the mages that could have been brought along. No doubt they would prove to be especially valuable if they were chosen representatives. Alex soon caught his ambitious thoughts and shook his head, it would be best to stay realistic. No doubt they'd actually only encounter a few men and women in 'armor', armed with copper blades and daggers. "At the very least I suppose we can hope for somewhat competent fighters." he then said with a shrug. "Ready to go?"